Two Steps Forward for KMb at UQAM / Deux pas en avant pour la mobilisation des connaissances (MdC) à l’UQAM – Mobilize This! Mobilize This! first published this post in French on September 13, 2011. We re-publish it here translated into English. Building on the excitement of the back-to-class period, the Office of Research and Creativity( Service de la recherche et de la création or SRC) introduced two new tools that will prove useful in the future. First, the SRC launched its new website. 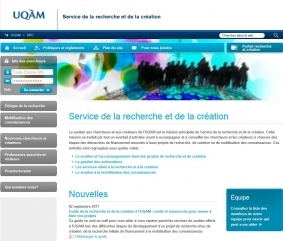 The content of the site has been completely restructured and expanded with the goal of making it an indispensable and user-friendly tool for the entire research and creative community at UQAM. From this site, researchers can find all the resources and information they need to manage their research and creative projects. In a second step, the SRC collaborated with colleagues in the Office of Partnerships and Innovation Support (Service des Partenariats et du Soutien à l’Innovation or SEPSI) to launch the first version of a guide entitled “Guide to Research and Creativity at UQAM: Tools and Resources to Ensure Your Projects Succeed.” This document is a tool to help researchers find their way amongst the many support services offered at UQAM during the many stages of a project, from the early stages of funding, right through to the eventual mobilization of knowledge. Designed primarily as an electronic document, the guide will evolve according to the needs of researchers at UQAM. From the perspective of knowledge mobilization, the launch of both products allows UQAM to remind researchers that a wide range of support services is already available on campus. The Office of the Vice-President, Research and Creativity, has also implemented a program to support the mobilization of knowledge, bringing together professionals from the SRC, SEPSIS and the Office of Service to the Community (Service aux collectivités or SAC) to both improve KMb services and make them more accessible. In a future MobilizeThis! 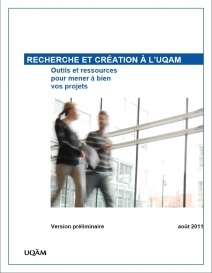 post, we will take you behind the scenes to the process we undertook in developing the “Guide to Research and Creativity at UQAM: Tools and Resources to Help Your Projects Succeed,” which was itself an interesting experience in knowledge mobilization within our university. This entry was posted in Announcements, Université du Québec à Montréal and tagged KMb, Québec, Research. Bookmark the permalink.